Hi, everyone! Sorry for the brief hiatus, things got a little crazy for a week or two but I got lots of reading done and have some reviews and other posts coming up! First, however, we have my recap post from the INCREDIBLE Ontario Book Blogger Meet-Up that happened this past Saturday, July 25th. I can’t thank the amazing ladies of Book Blog Ontario that organized this event enough. Aside from the book haul, it was so amazing to meet and talk to other people that love to read and discuss books just as much as I do. This was my first time at the event but I definitely intend to keep going back! The meet-up was hosted at the amazing Ballroom in downtown Toronto. I wish I had taken some pictures of the place but I was caught up in the frenzy of the event. I got there around 1:30, I think I was one of the last stragglers to come in (thanks in large part to the TTC and the chaos of downtown transit with the Pan Am games going on). I was greeted by some of the amazing hosts, scanned my ticket, and then proceeded to the table of wonder. This is what it looked like before everyone showed up (Photo from the Book Blog Ontario ladies themselves). When I got there, I had a choice between The Blackthorn Key, An Inheritance of Ashes, The Sisters of Versailles, and Chasing a River (we got to pick two). I’ve been eyeing Kevin Sands and Leah Bobet’s books since finding out about them so those were the natural choices (although I was dying for a physical ARC of The Scorpion Rules). After the table of bookish wonder, I was directed to a table of book swag. Buttons, Bookmarks, postcards, there were even bottles of tea (which I didn’t realize was tea until it was too late and they were gone…but I already have too much tea anyway :p)! Here’s a picture of what I snagged off the table. I may have missed some as I still haven’t fully reconstructed my room after my weekend of chaos but this is the gist of it! I also got a couple of pens from Random House that didn’t make the picture because they’re already safely in my bag to use for day to day when I find myself in need. From there, the rest of the day was a blur. I started to head over to the table where people were leaving the books for trade/giveaway. It was a whirlwind of meeting people thanks to that. I went a little request crazy so I had a lot of books to pack up but it was awesome to meet people while getting them! I didn’t have much to offer for trade so I made sure to write “Thank You” cards for all the absolutely amazing bloggers that shared their books with me! It was an added bonus that it made me not be an awkward turtle and avoid talking to all the amazing people I’ve been interacting with on Twitter. Once I’d finally packed away all the books and had them stashed to the side, it was time to move around and mingle even more. There was a lot of chatting and introductions going on but I managed to focus long enough to have some food (mac and cheese, a slider, and some poutine…all were faaaantastic). I was also lucky enough to get to have nice talks with Erin Bow and Leah Bobet! They’re both incredible women and I loved how much excitement and adoration they showed for each other’s book! 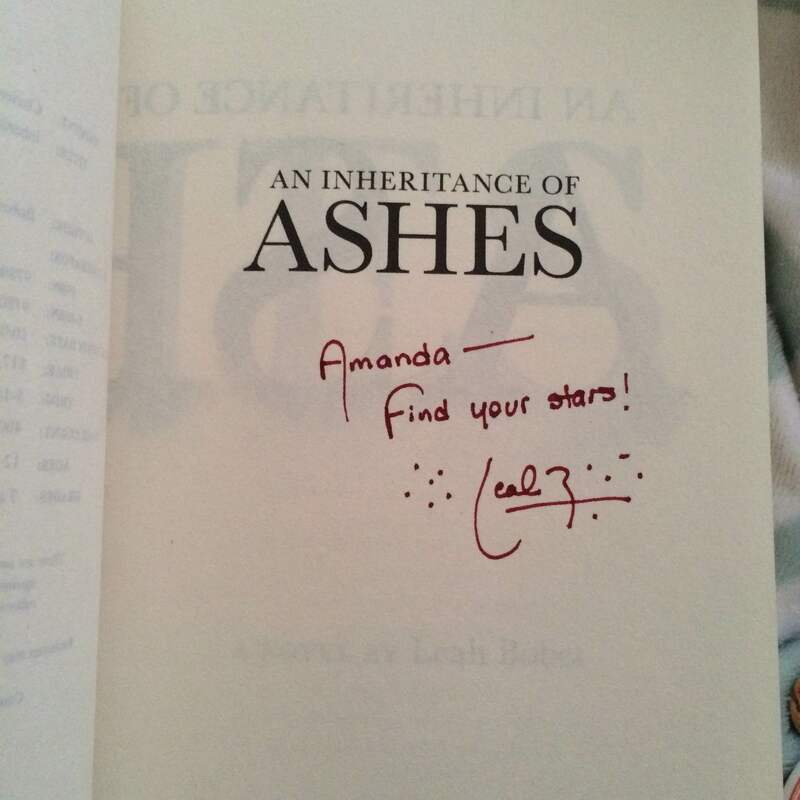 It’s cute when you see authors fangirl over another author’s work. They’re just like us! 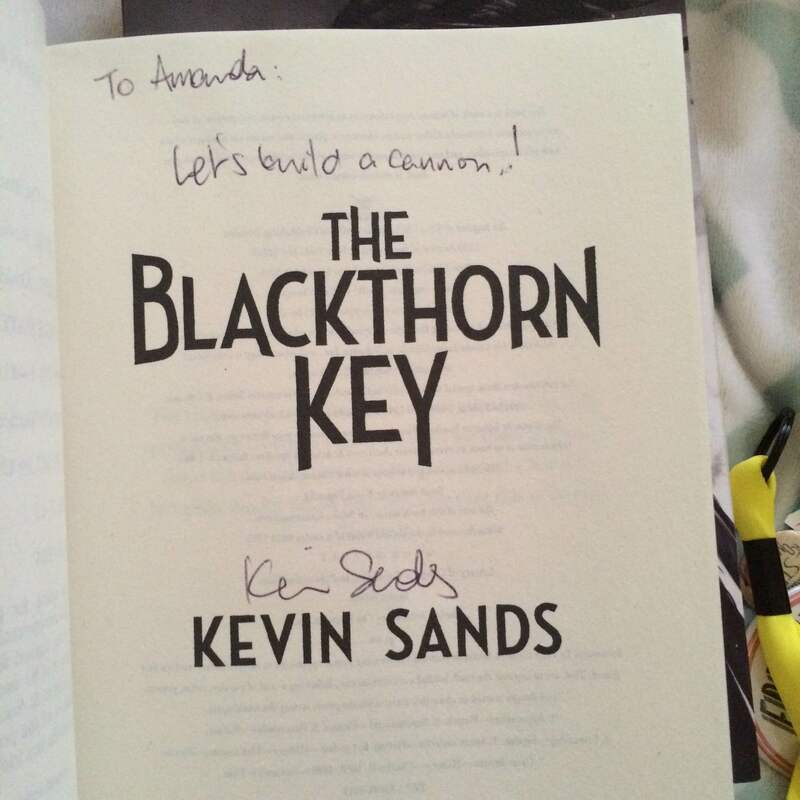 The hosts also hosted a raffle for lots of awesome bookish prizes! I didn’t win them, but that’s totally cool because I was already going home with tons of awesome books. I hope everyone that did win loves their prizes! It was fun seeing how excited people were when their number was called. 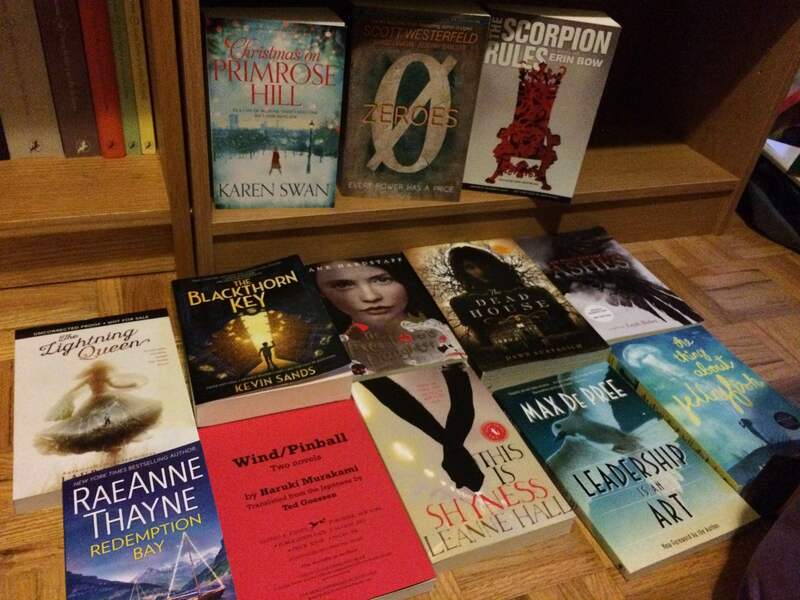 At around 3:30, the hosts put some books that wouldn’t fit into the swag bag up on the bookish table of wonder! 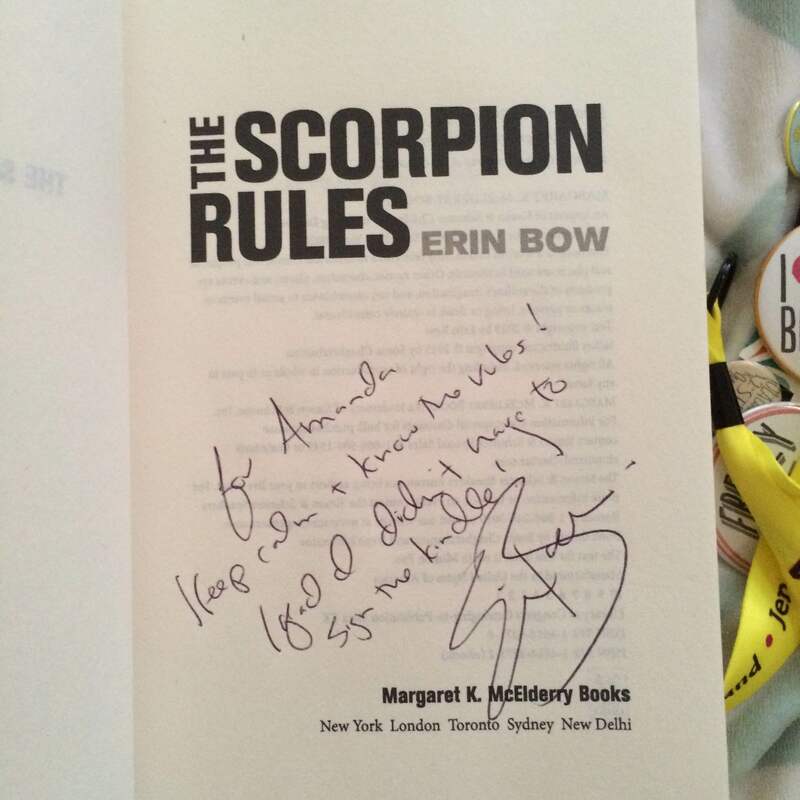 I wandered over a little later to see what was left and…drum roll…there were copies of The Scorpion Rules!! It was all I could do to keep from doing a little happy dance right there on the spot! Naturally, I picked up a copy as well as grabbing a book on leadership that’s perfect for someone I know. I made my way back over to Erin Bow to get it signed and had another chat with her. That was pretty much the conclusion of the event. Everyone started to gather themselves and their books (all now understanding why the hosts told us to bring extra totes). I wish I could mention everyone I talked to at the event but it all went so fast that I couldn’t list everyone even if I tried. At least I don’t think I could haha! To finish this recap off, I’ll leave you with some pictures of my haul from the event. I’ve basically ruled out having a social life for the foreseeable future because all I want to do is read. 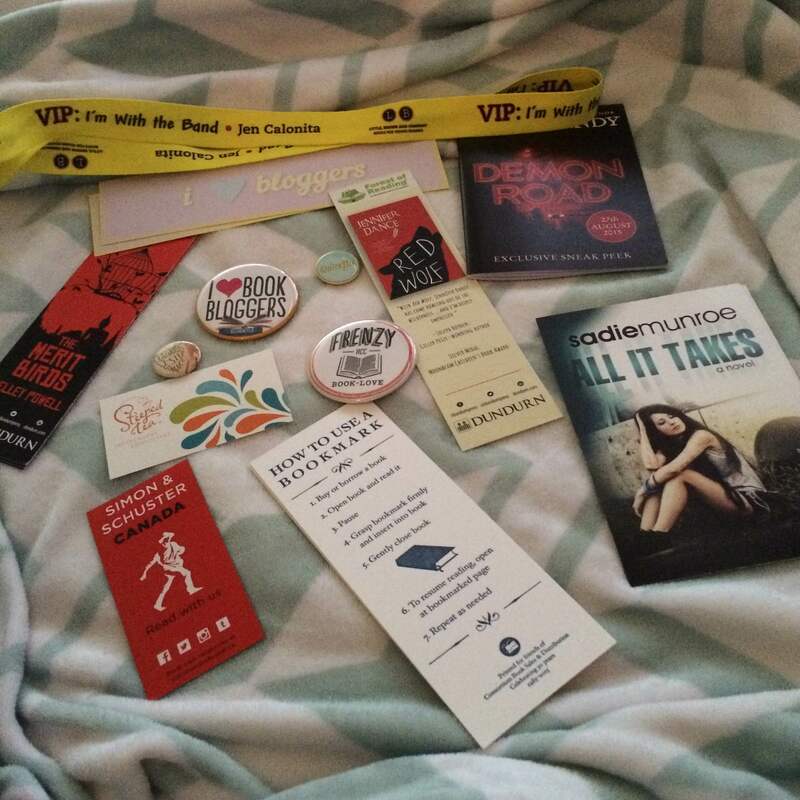 These are all the books included in the goodie bag/picked up off the table of bookish wonder! I can’t thank those that provided them for the event enough. So many titles I can’t wait to read! The books I was able to get signed by the amazing authors! And last but not least, a picture of the full haul! 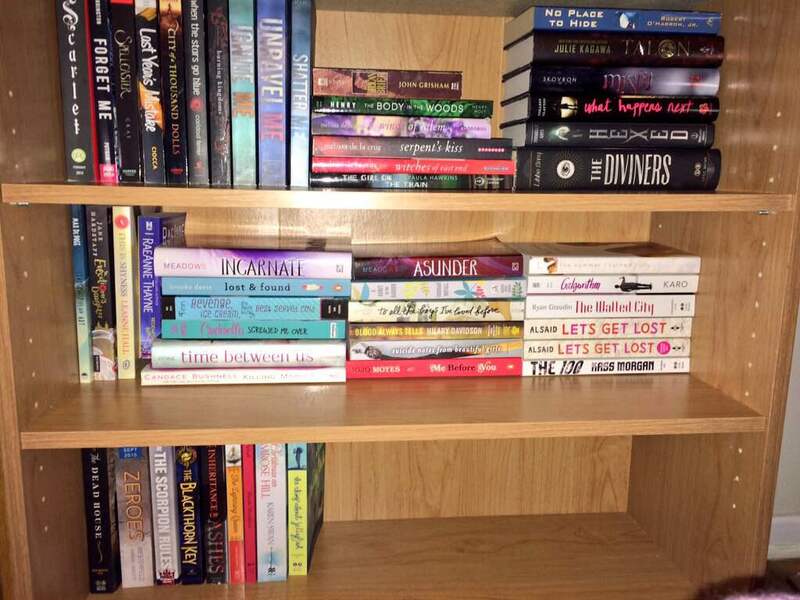 Most of this came from other AWESOME bloggers being kind enough to donate some of their books for giveaway. So many of these I’ve been dying to read. Plus, seeing a shelf full of books from the event right at the end of my bed is a happy reminder when I’m hanging out and blogging, reading, or watching Netflix! That’s all from me! I can’t wait to attend another one and run into the bloggers I met at this event other places too! Thank you again to all the hosts, publishers, and authors! Haha, a blur is definitely a great way to describe the experience! I didn’t even know those three hours passed by but I guess time flies when you’re having fun! It was nice chatting with you briefly too even though there wasn’t a formal introduction a la handshake or anything. At least, I’m really hoping I did talk to you otherwise this paragraph is moot LOL. Yep! That was me! Really great chatting with you too! I don’t think I had many really formal intros that day. It was mostly just getting sucked into other conversations as I went along.